I am the child and grandchild of Holocaust, and what I call Diaspora, survivors. The effect of these traumatic events on my life is becoming more apparent as I get older until it became clear that I would have to trace their origins from the time of my parent's childhood up until now and begin to expose these hidden life-long feelings. The impetus for this journey began as an answer or explanation as to why I almost never say the words, 'I love you'. During my grandparent's war-torn generation the ability to express affection almost disappeared. It was as if expressing words of love after the horrors they had faced would somehow demean the enormity of the tragedy. If you could love again, then how bad could it have really been? Innumerable stories have been written, and continue to be written even at this late stage, about the Holocaust and dramatic survival. As the population of original survivors is gradually disappearing, it becomes even more important for the next generations to gather as much of the factual information before it is too late. I have come to realize that not only had my mother’s family survived the Holocaust; but that my father's family had also 'survived' in pre-WWII Poland, living through anti-Semitic pogroms, emigrating to Palestine where they suffered enormously, eventually leaving for the United States, arriving in 1929 the year of the Great Depression. All of them had experienced forced abandonment of the known to enter the unknown; changes in homeland, languages and names due to the historical, wartime events that were not in their control. These affected my parents and grandparents, and ultimately my generation as well. It is my purpose here to discuss the trans-generational traumatic effects that these experiences had had on a specific population, family being just one example. Eventually, we, the children and grandchildren will be required to come to terms with our ancestor's pasts as best as we can, incorporating them into our own lives; present and future. It is my hope to begin this process as an intergenerational and international discussion. Many of us alive today have been affected by the Holocaust in some way; Jewish or not, survivors and their families or not, and yet we continue to relate to the Holocaust as if it had begun only recently. Unbelievably, we are a mere seventeen years from the centennial anniversary of the Nazi party's initial rise to political power in 1932. Any attempt to break the near-pervasive silence that has been the norm in war-torn, twentieth-century America, Europe and the world may hopefully yield positive results in unifying the global village of today. The pogrom, like many others that occurred that summer of 1941, represented the Romanian's attempt to “cleanse the terrain” of its’ Jewish population. (Solonari 2010, 160) No Jews remained in Stanestie. My family’s survival was close to miraculous after my grandfather was captured and escaped. ChanaWeisenfeld, mentioned above, is my mother’s first cousin, aged 82 today. The pregnant woman, beheaded in the forest of Vivis, was my grandmother’s sister and my mother's aunt. Her name was Chaika. I am her namesake in Hebrew; Chaya, and in English; Carol. After the pogroms, survivors travelled for several months, from July until October 1941, on foot or by wagon, surviving typhoid and horrid conditions, under constant Romanian guard until they reached the Transnistria concentration camps. My mother’s family survived. My great-grandfather did not. There, life under the harsh hands of the Ukrainian/Romanian/Nazi guards was exceedingly difficult. Sometime soon after their arrival in Transnistria my mother's family received a reprieve of sorts that more than likely saved their lives. The Russian owner of a melon farm bribed guards to release 40-50 laborers from one of the camps. They were taken to a barn, each family to a room, and there they lived for close to three years near the tiny Ukrainian village of Politanki. They lived a mini-Schindler existence; hard labor in exchange for life, food, and advance notice if the Nazi or Romanian army approached. If they did, they were sent deep into the forest; food sent out to them and then brought back after the danger had passed. The farmer had been offered the highest award for saving Jews by the Israeli government; but he refused to accept it. Perhaps he had worried about future repercussions in his own country it became known that he had helped Jews and gone against his own government during WWII. After the war ended, my grandparents returned briefly to Stanestie. There, killers roaming the forests were searching for and murdering any potential witnesses to the pogroms that had been carried out by local, non-Jewish villagers. Warned by a kindly neighbor, after spending a few hours at her home, they left before dawn, never to return. No wonder my grandparents left Romania as quickly as they could and ran to Germany, empty-handed. Nobody there was going to take responsibility for Jews who had survived anyway. The rapidly changing borders had made it convenient for many countries to say, ‘They aren't ours’. The lack of facts may be useful for those who say the Holocaust never happened on a large scale. As the last original survivors pass away, the voices of those who perished without gravestones will be extinguished forever. No, this concept is not new; but because of it I continue thework, to pay homage to members of my close family who I know had existed in Romania and Poland until July 1941. I can use myself as an example of one who has experienced this search for knowledge and answers; the Holocaust as a 'rumor' or word that has no meaning, turned into a black hole of silence, sadness, depression, of those around me with no explanation. How could I be completely happy? I never felt like I truly fit in; now at least I know why. I may have been born in America, but my parents and grandparents were all of Eastern European, Austro-Hungarian background, mentality and culture; most having accents. I had always been proud to be American, but my 'Jewish-ness', 'child-of-Holocaust-survivor'-ness had always held a subconscious grip off-stage. It could be that the ‘Second Generation Survivor Syndrome’ begins in infancy. Halasz describes how the “second generation offspring witnessed that silence… those exiled moments when he, the infant was hungering for relatedness. Instead he met the survivor parent's ‘fated exile’, a wall of silence.” He adds, "there may be unexamined danger in being named after deceased relatives, in that parents may only see the dead relatives in their children and therefore not ever really see or know their own child…For the second generation survivor, this may mean that the child in turn may grow up having a blurred or undefined identity.”(2002, 217) I began to be interested in learning about the Holocaust at an early age. I now believe that having been named after an aunt killed during the Holocaust may have been the basis for this early onset. I had grown up with the loud silence of knowing that there was something out there, but what? A loud, earth shattering scream of nothingness, that reverberated in my ears from the time I was born. I knew nothing, and continued to know nothing for years. I never got the message or information from the original source itself. This now is very frustrating, because I would like to have heard my grandfather tell me the story at least once in his own words, to hear his fear and feelings. I would have liked to hear my grandmother speak, even once, about anything at all, or about the day they left their hometown without my grandfather. What this must have felt like I can only imagine. My mother has written her story, and although now she will answer questions if I ask, it is still a bit like prying open a can of sardines. Is this why I keep so much inside? We, the second generation, have been relegated to remember the Holocaust as if in a virtual time-machine; almost as if we had been there ourselves. This may not happen to every survivor’s child, but similar to a gene, like alcoholism or diabetes; some of us have the predisposition to be the carrier of the message. This might be set off by incidents in our own lives or perhaps this is learned behavior, gleaned from the sad, introspective, smile-less face; slow movements or hunched-over shoulders of our grandparents; physical exhibitions of their own never-released inner traumas. As our own middle age encroaches, we may be able to reveal the truth. Yes, indeed, without a doubt, our own identities were formed by their connection to that horrible, historical anomaly; duly transcribed and reported in every tiny, minute detail by the Nazis; the Holocaust. This is what we had to compete with. Is it any wonder that we have been spoiled almost to death? We, call us what you will, the second, third, next, future generations are bearing the brunt of the anger, sadness, unknowable, untellable loss that our parents and grandparents had suffered. We, connected to them by blood and sorrow, must build on this and move forward with the same type of strength and courage as it took for them to be able to survive. Whatever has happened to them is done. They will not tell us any more than we already know. It is this silence that the second generation has endured that has made it so important to get the facts straight now before it is too late. I can apply her theory to my grandfather, who never spoke about his own personal trauma to me as a child or young adult. Did Silence help him create a new life in America, raise two children, and build a successful business? I suppose that the key word is ‘partial’ when describing the amount of healing a person can go through after incredible trauma, losing half of his siblings and his parents while he, himself, survived. My grandfather was a lovely man, generous, caring and always wanted the best for his family. His children and grandchildren were proof of his strength throughout the untold horrors he had faced during WWII. But the scars were deep, and in all the years that I knew him, except perhaps toward the end of his life, his expressions of warmth were minimal. I knew that he loved me very much. He never said so. I cannot explain even to this day what caused this withholding of information; to keep one of the major catastrophes in the history of mankind inside; not shared with members of your own family. Botez suggests that "silence is never empty or devoid of meaning, but 'inhabited' by poignant content pointing to trauma, loss and an inability to understand or cope with … loss". (Botez 2012, 17)20 Would they have been able to tell their stories without breaking? It was that exactly; that inhabited silence; the practically void, brief, uncompleted lives of my grandparent's sisters and brothers; and the Unmentionables, the Unborn; the brothers and sisters of my mother and my uncle, who cry silently without tears. THIS is the epicenter of our sad melodrama, those almost forgotten souls. Overdramatized? I don’t think so. This is the Truth as I know it. It is what we do with the knowledge now that is essential, not only for me and individuals like me, but as a jumping off point for universal discussion and repair. As in a court case where thousands are represented; so shall it be here. Something changed in me after I visited Stanestie in 2007. It is clear to me that not much has changed there; only the universal shame, guilt and pain in the local citizens has remained. The residents who were born after the war feel somehow responsible for the actions of their parents and grandparents even though they had nothing to do with them. As the book title suggests, the “sins of the fathers” have stayed with them; with tears in their eyes. (Woods 2013) One man around my age leads us through the Christian cemetery to the collective gravesite for the Jewish victims of the pogrom, shaped like a Star of David with a small commemorative plaque written in English, Romanian, Russian and Hebrew; we comfort him. Recently, I made a personal and very difficult journey to the Ukraine, whose goal had been to reach the tiny village of Politanki where my mother had been in hiding from October 1941 until the end of WWII. I was finally able to begin to understand what Transnistria had been at that time. In the words of a middle-aged Ukrainian woman who we had met there; she described to my barely-Russian-speaking cousin what had been told to her by her grandmother many years before. “Eleven kilometers from here there were ghettoes that were run by very bad Romanian Fascists." She added, “Here, there were Romanians too, but they were not so bad”. Trying to figure out if there had once been a melon farm in the area seemed a bit too much for our language barrier to cross. This trip made by one child of one Holocaust survivor, travelling nearly a quarter of the way across the globe, on roads that were not roads, at border crossings that could not be imagined; an impossible, impulsive drive to find the truth and see it with my own eyes. Not because I did not believe that it had happened; but because it had never been truly explained to me in words; only in shadows and sketchy outlines that left no room for imagination. Reality, in all its glory, sadness, emptiness, colors of pale green endless wheat fields, nothingness, had been registered and claimed! I had come to the most complete understanding of what my mother had gone through that any survivor’s child could; only after an incredibly hard and unusual trip, involving chance coincidences, other people, several countries, diplomatic assistance and Russian translation of information that probably couldn't even be found on the English language World Wide Web. This, I was able to do, with thanks to those know who they are. Now that I have seen first-hand where it all took place, can I say that post-memory has become my memory, too? I am not sure. But, the fact is, I was able to put in the last piece of the puzzle; and the puzzle has been solved! Today, nearing 80 years since the beginning of the Holocaust; the largest organized mass murder in history, we continue to ponder the source of its inception; the root of the wasted intelligence on an evil plan developed only to try to eradicate one of the most ancient peoples known to mankind, and there is no end in sight to our conversations. However well-adjusted my mother was in her adopted country of America, the shadowy phantom of Eastern Europe still lingered above her, as it did all survivors. 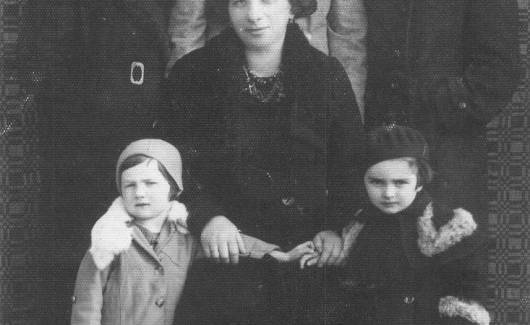 She may have tried to escape the vestiges of the Holocaust by losing her accent; feeling at home in the United States; working; getting married and raising a family. But, "their children, whom they have proudly raised in a free country carry their parent's burden of traumatic memories, not always sure of the extent of their harmful grasp." (Botez 2012, 24) There is no question that my mother was unaware of the potential influence that her own Holocaust experiences might have had on her children. It is this late knowledge and recent understanding that we are dealing with here, and must find the correct path on which to send the message out to the world. It has taken me fifty-eight years to get to this point of self-analysis and self-understanding. It is not for the lack of trying, many times, and many ways. Is it better late than never? You bet, especially for my children's sake and perhaps others as well. Perhaps writing it all down will lead the revelations in the right direction. One of the main reasons that I don’t say ‘I love you’ often is because it wasn’t said to me by my mother as I was growing up. It could be said that wartime isn’t exactly the proper atmosphere for giving affection. ‘Normal’ emotional involvement of a parent to a child in expressions of endearment are reduced to a minimum or eliminated completely when the threat of death hangs over you daily like a tiny dew drop dangling from the edge of a blade of grass at sunrise. You know it will fall; it’s just a matter of time. My mother told me that what she remembers of her early childhood before the war was happy go-lucky. She didn't have any young friends, but she remembers playing with workers in the lumber mill and enjoying herself. This must have come to such an abrupt, unexplained and unexplainable stop that whatever happiness she had enjoyed as a child had been buried forever, never to be retrieved even later on in life. How can a person who has suffered trauma like this be expected to raise a child herself in a traditionally 'normal' way, and so on in the following generations? This is the question being raised here. At a recent book-signing event for my book,“I love you, they didn’t say", (Elias 2015) in which I deal in part with the lack of verbal affection from my mother toward me as a child; my mother, for the first time, began to understand what had had happened to her during the Holocaust.She described to visitors at the U.S. Holocaust Memorial Museum in Washington D.C. how she had experienced an almost complete emotional black-out for approximately three years, from her parents towards her, and from herself towards the outside world. It was quite a cathartic, heart-wrenching and heart-warming experience for me to hear her speak, when at first she could not understand why I had entitled my book this way. I don’t need results from studies on psychological responses in children of Holocaust survivors; I just have to look at myself and my brother as a two-case sample study. We are two specimens of a unique twentieth-century phenomenon and whichever way we have turned out will continue on and on until we stop it or at least try to. I know where this detached demeanor comes from and even though I do, I cannot change it. Maybe this work, which started out as a way of organizing the stories of my mother’s survival, has now turned into something much, much more. Those who had lived through hell and come out on the other side could not have possibly comprehended the effect it had had at the time and would have on them later on. They could not have imagined the effect it would have on their offspring, and on the children of their offspring. This article may open the doors for discussions, NOT necessarily for the survivors themselves, but for those who have come after them. We have to start to breathe. I am not guilty, nor is my mother, father, grandparents, nor are any of them. The world is a dangerous place and becoming more so every day. God says we are supposed to stay alive under any circumstances. Life is sacred in its most natural form; it is what matters. Without humanity we cannot continue to report the progress of mankind to each generation that follows. This is our mission; our purpose: to learn, grow, teach; to educate those that are here with us today and will pass on the memories to those who will come next; our own future generations. 1. Appelfeld, Aharon, “The Story of a Life”, Keter, Jerusalem, 1999. 5. Elias, Carol, "’I Love You, They Didn't Say’- Holocaust and Diaspora Survival : the Next Generations”, Orion Books, Israel, 2015. 7. Geissbuhler, Simon, "'He Spoke Yiddish Like A Jew' - Neighbors Contribution to the Mass Killings of Jews in Northern Bukovina and Bessarabia in July, 1941". "Holocaust and Genocide Studies", 28, no.3, Winter, 2014, pp. 434-449. 9. Halasz, George, "Can Trauma be Transmitted Across the Generations?" in "The Legacy of the Holocaust: Children and the Holocaust", eds, Zygmunt Mazur, Fritz Konig, Arnold Krammer, Harry Brod, Wladylaw Witalisz, Jagellonian University Press, 2002, pp. 209-223. 14. The Nizkor Project, "Shattered! 50 Years of Silence: History and Voices of the Tragedy in Romania and Transnistria: The Unknown Killing Fields of Transnistria." I am a fifty-eight year old woman who has been living in Israel for the past twenty-three years. I have two children, both who have served in the Israel Defense Forces. My son finished his service last year and is now studying Graphic Design. My daughter, who is an officer in her third elective year, is a liaison between injured soldiers and the Army, and regularly visits families who have lost loved ones while. I hold a Masters and Bachelor’s degree in Psychology from major universities in New York State. I worked as a Guidance counselor in New York City before moving to Israel and raising a family. I attained a permanent Teacher’s license in Israel, where I have been an educator and supervisor for over twenty years.